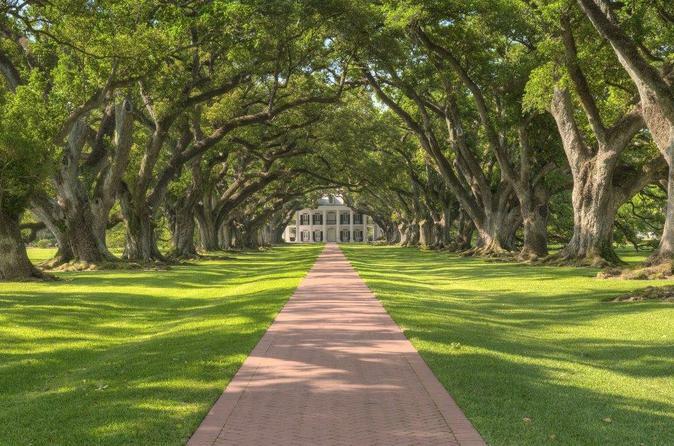 Enjoy a 5-hour small-group tour to Oak Alley Plantation in Vacherie, Louisiana from New Orleans. Plantation tour guides give narrated tours in period costumes, providing views of all of the rooms on each of the first two floors. Oak Alley Mansion itself has a unique history of rise and decline along with its extensive history as a plantation and sugar mill. Transportation is provided in a luxury executive class van for up to 13 people. Get picked up at your New Orleans hotel and enjoy your driver's informative narration as you travel the roughly 1 hour to Oak Alley Plantation. Learn about French Quarter history and architecture, the growth of New Orleans, the impact of Hurricane Katrina, and the basics of Louisiana bayou country and wildlife. Upon arrival at Oak Alley plantation you be will met at the front door by a tour greeter. Beverages are available for purchase at this point - including the classic southern cocktail, the mint julep. Beverages are allowed on the tour and lids are provided if you would like to bring one along. The first portion consists of a 45-minute narrated tour of the first and second floors of the majestic mansion. The tour is made all the more interesting by the staff, who are outfitted in period correct costumes. The tour covers the history and operations of the plantation and sugar mills, the history of the families that have called Oak Alley home, and the many ups and downs of the mansion itself. The second portion of the tour is self-guided, leading you through the grounds and exhibits including several replica slave cabins. The self-guided tour ends at the cafe, bar, and gift shop. Guests are invited to grab a bite and a beverage and peruse the gift shop for a bit before boarding the van for a 1-hour narrated drive back to the hotel.